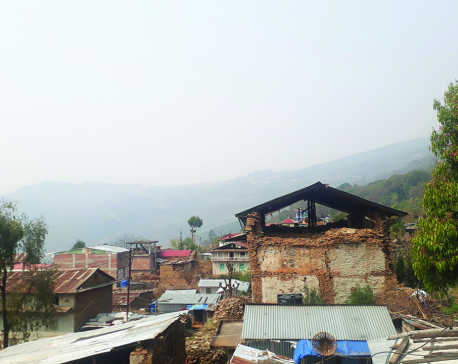 Houses damaged by the earthquakes in April, 2015 in the ancient town of Dolakha Bazar, Dolakha in this recent picture. DOLAKHA, March 27: From distance, it looks like a majestic ancient town. The beauty is breath taking. As you go near, the settlement gives you a disturbing feel. The houses are in ruins, and it feels that they can crumble any moment and you would fear to stand around for a little while. However, the village is still home to its inhabitants. Until before April 2015, the town was thriving and its infrastructures was in good condition. The devastating earthquake that month took a toll on its form and beauty. 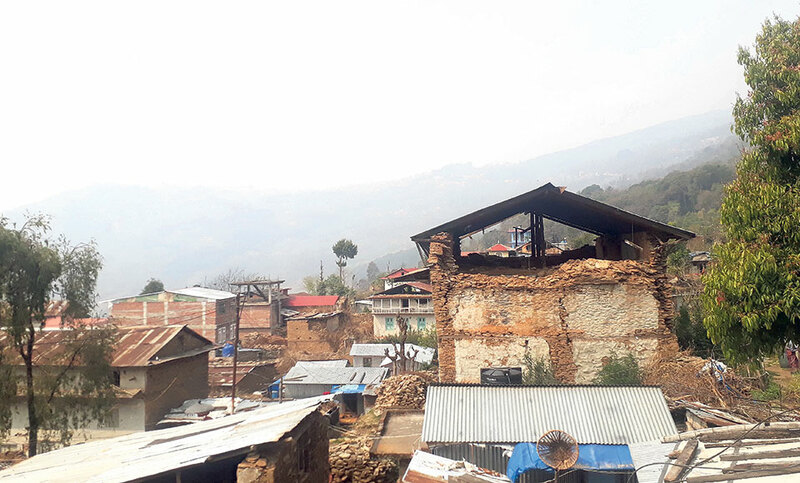 In lack of repair or reconstruction efforts, even after almost three years of the disaster, Dolakha Bazar continues to wear a dreaded look. “Locals feel very much unsafe. Earthquake ruined it,” notes Rakesh Shrestha, local of Dolakha Bazar. “Even after so long time of the earthquake, we have not risen from the rubbles,” he added. The houses in the Bazar are typically made of stone and mud. Many of these houses were fully damaged and some were partially damaged by the earthquake. Houses that were partially damaged gradually caved in the aftermath of the earthquake. 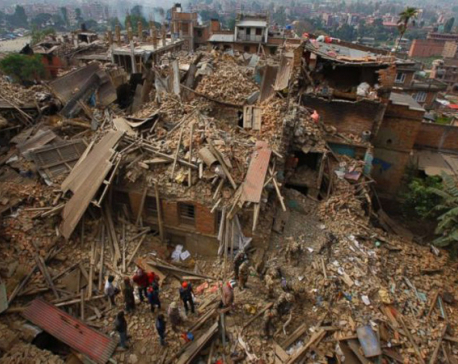 Their windows, doors and walls collapsed over the time, Shrestha said. “In lack of resources to resettle elsewhere, many of the residents started living in their damaged houses. Some of these houses don’t have proper walls, windows, and doors,” Shrestha said. Shrestha laments that the town, which was a glorious example of the Malla era architecture, remains neglected. Some of the houses, temples, and palaces in the this area were built during the Mall era and locals would take pride in it, he said. Shrestha claims that some of the residents have been obstructing in the reconstruction of the town. “There is a division of opinion among the residents for reconstructing it. 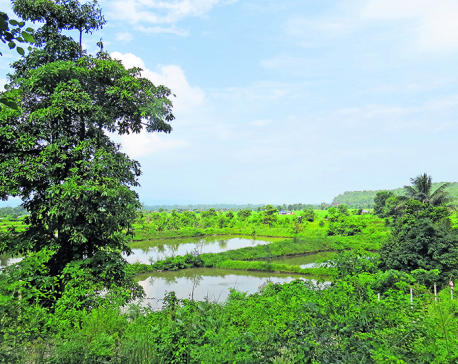 Some residents want to reconstruct the town but some others oppose it vehemently claiming that such a move would deprive the town of its ancient relics,” he said. As the earthquake destroyed the town, it is in need of a huge investment to rebuild. So far, neither the authorities concerned nor the locals have taken initiatives toward it,” he added. Apart from personal preference, joint ownership of a house, has obstructed the reconstruction efforts. Even if one of the owners is convinced for reconstructing the damaged house, other owners don’t approve the plan. “Actually, it is related to the community’s tradition and lifestyle. Most of the families still live as part of a joint family. Because of such culture, family assets including homes remain undivided among brothers. Reconstruction of such co-owned houses has been another severe issue,” Shrestha said. He criticized authorities for not spelling out clear policy on reconstruction of houses that have multiple owners. He further criticized the government for formulating murky criteria for assessing the damages done to a home. “They don’t have clarity in their criteria for marking a house as fully or partially damaged. The criteria are not defined well and as such, if officials are corrupt, they can certify houses as per their will by distorting facts. Here, many locals have done so,” he reported. Majority of the town’s population are Newars. They hesitate to tamper with their tradition and properties, Shrestha said. “We believe in living together under a single roof. We have been doing so for ages. But after the earthquake it has become a serious problem,” he said. Some of the damaged house belong to residents who don’t live there anymore. Most of them live in Kathmandu and care little in reconstructing their ancestral home, Shrestha claims. He claims that such abandoned houses have been posing risk to people who live there and to occasional visitors. “This is a historic town. Visitors love to come around. But you see, the houses are on the verge of collapse and visitor could be injured,” he said. Birajman Shrestha, ward member of Bhimeshowr Municipality-2, several donor agencies have extended willingness to help in reconstructing the town. He said that reconstruction could start very soon in the future. “It is not that we are not worried about it. We are planning to reconstruct the town very soon, several donors have expressed willingness to work with us in doing so,” he said.